The illustrated Old Timer Knife is the Large Canoe Old Timer Knife that features spear and pen blades made of 400 series stainless steel with nail nicks for easy opening. The sawcut brown Delrin handle of this Old Timer knife, 3.6" closed, has brass liners, Old Timer shield inlay and nickel silver bolsters. 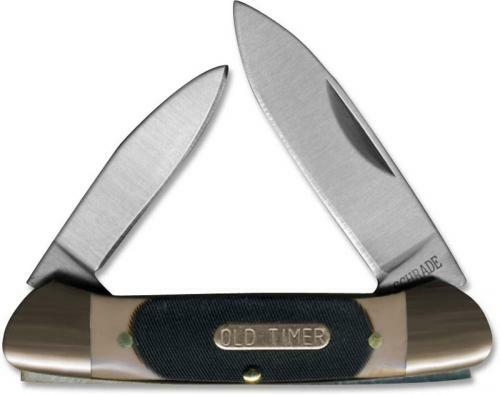 The Old Timer Large Canoe Knife weighs 2.5 ounces. This Old Timer Knife is imported from China. I buy these knives for the purpose of resale at gun shows. This large canoe catches the attention of women as well as men. Most women preferred this knife over the mighty mite.